FishFlix.com is your place for Christian media! They have not only the latest in Christian DVD's, but they have classics as well. 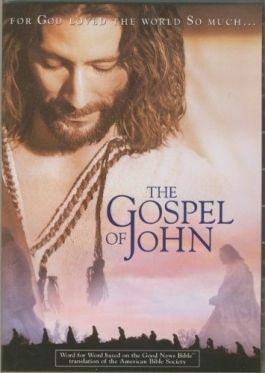 Gospel of John was released in 2003, and I have no idea how I missed it when it first came out. I was so thankful that this title came up for review and that we asked to check it out. We have not found a more biblically accurate movie to date. This movie is the actual Bible's book of John from the American Bible Society's Good News Bible. No word left out, changed, or deleted. Wow! When is started to write the review, my 17 year old asked me what is the highest rating for a movie and I told him 5. He instantly said, "This is a 6!". From a 17 year old! He appreciated that the word hadn't been changed, that we could watch a movie and know that nothing had been left out. Being the Bible scholar that I am.. not, I decided to follow along with my phone app while watching the movie. I actually found it fun to tell the family where we were at in John as each sequence developed. There is quite a bit of narration by Christopher Plummer. When the word doesn't indicate that anyone is speaking, then the narrator is. While he is speaking though, the actors are performing the scenes, so it is still exciting. Filmed in Ontario, Toronto, and Almeria and Andalucia Spain, the scenes are beautiful. "Great drama between narration and people speaking the word", says my hubby. Henry Ian Cusick plays Jesus. My older boys knew him from another show, and that caught their interest. He did a great job portraying Jesus, showing love and mercy, yet at times having a holy anger for those sinning against his father. When I first saw this movie was 180 minutes long, I was worried that we wouldn't get through the whole thing. We watched it for pizza and movie night with the whole family, ages 8, 11, 14, 17 and adults. We all loved it, and thought it was one of the best bible movies we have seen. We tend to watch bible movies and pick out the flaws in them, and they send us to our bibles to find the errors. With this we were excited to have each and every part in the show. The crucifixion of course showed blood and violence, but near what some of the other movies have depicted. It does have a pg13 rating, but it really wasn't more than my little guys could handle. I want them to see the truth of what happened to Christ, and I am sure this was scaled down immensely. FishFlix.com is one of our favorite "go to" site for Christian movies. Their website is very easy to maneuver. The left sidebar has common categories for you to search. They also have a search bar if you have a specific movie title, or genre that you want to search for. I really like that they have "Coming Soon" tab where I can find the upcoming movies for my family to watch and get them on preorder. See some of the other FishFlix.com movie reviews by clicking on the banner below. we thought this movie was pretty good in our household as well.